I am proud to announce that I have just published the one hundredth video to my YouTube channel. 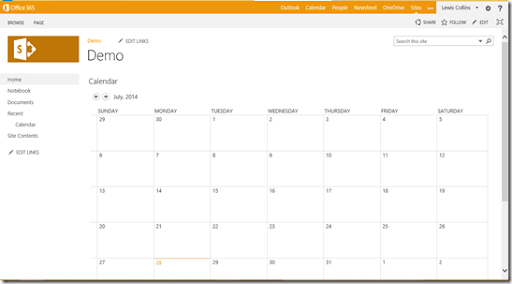 This video provides a walk through of how to configure an Office 365 users desktop if they have Office 2010 by downloading and installing the Office 365 desktop setup client. 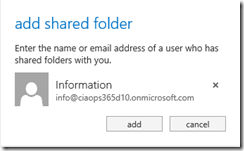 This desktop setup is only required for those with Office 2010 or 2007 but not 2013.
but don’t maintain that channel any more. I hope you enjoy this latest video and I look forward to creating the next one hundred. If you have any topic suggestions or walk throughs you’d like to see me do then my all means contact me or leave a comment on this post. The above video is also another great insight from management gurus Seth Godin and Tom Peters as to why blogging is so critical today. 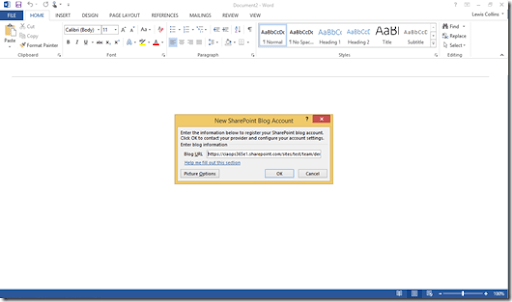 What you may not realize is that SharePoint Online allows you to publish to blogs via a number of different methods. So what I’ll do over the next few posts is cover off all the details about that. 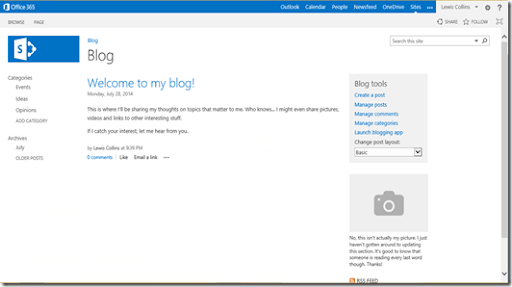 The first option that is available to you with SharePoint Online is to create a blog site in a Team Site. Remember, that a Team Site is designed for multiple people to work together and share different types of information together. A Team Site blog is a great way to capture information and ideas from all people working on the project and make it easy to share. So to create a Team Site blog you’ll firstly, navigate to the Team Site you wish to the blog to appear beneath. 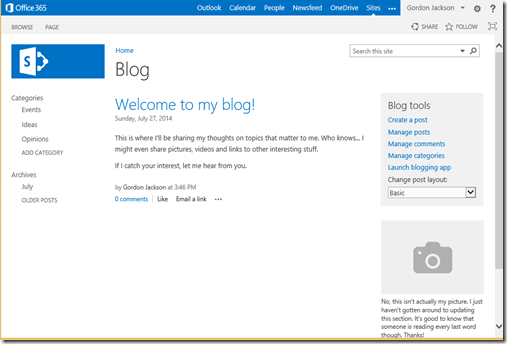 With SharePoint Online a blog is created as a sub site. 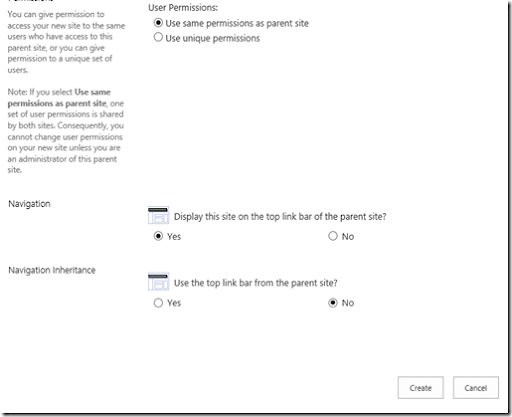 You’ll also need to have the rights to create sub sites in SharePoint Online but if you do, select the Site Contents link from the Quick Launch Menu on the left hand side. 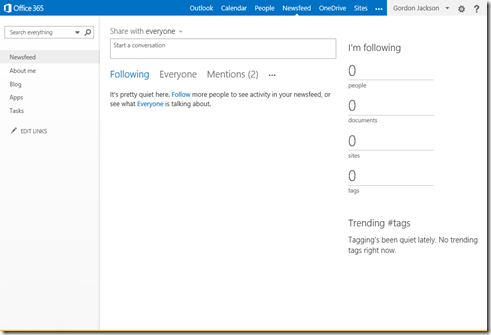 This will take you to the area where you can see all the apps you have installed into the SharePoint Team Site as well as add more. 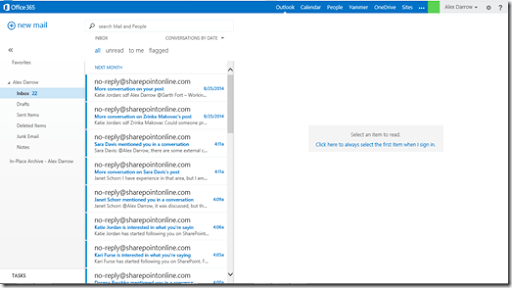 Down the bottom of the window you will find a heading Subsites as well as link to create a new subsite. Select this to continue. Much like creating a standard subsite you’ll be asked to complete the site Title and Description as well as the site URL suffix. 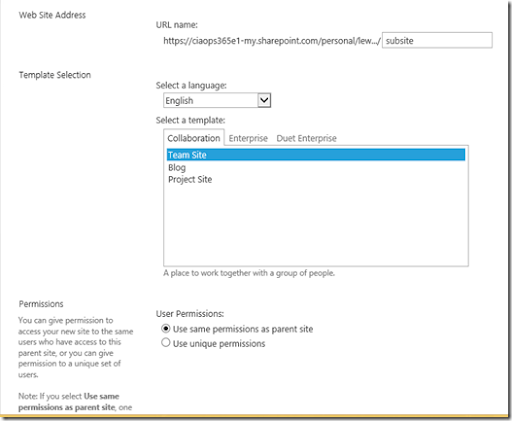 Now to get all the blogging abilities you need to select the Blog template option under the Collaboration tab in the Template Selection area as shown above. 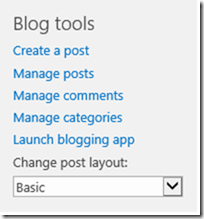 You can then make any further changes to the desired blog site, scroll down and press the Create button. 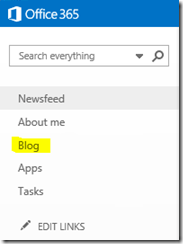 In a matter of moments you should see the new blog site shown in the window. 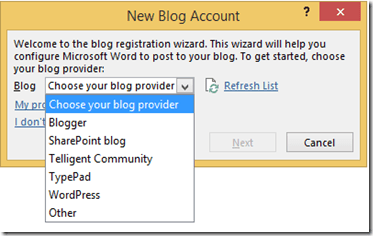 You can now use the Blog tools options on the right hand side to interact with the blog site via the browser. 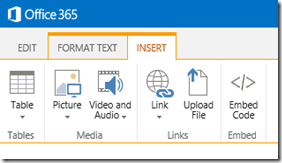 inserting a variety of items such as tables, images, videos, links, files by selecting the Insert ribbon tab. There is also the option to directly embed HTML code. 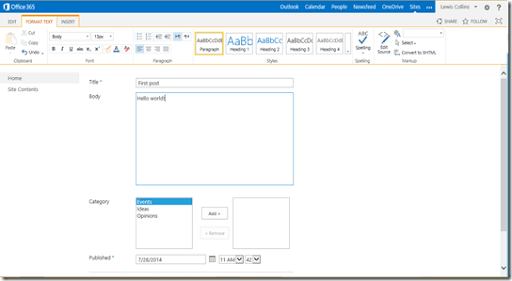 When you have finished editing your post you simply press the Publish button at the bottom of the screen. You will be returned to the home page of the site and your post should now be visible as shown above. 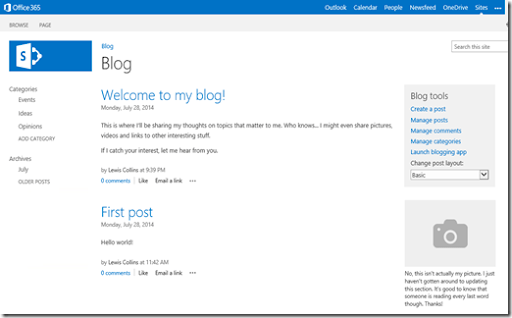 So that’s really al there is to creating a blog site for a Team Site in SharePoint Online and getting up and running. In the next few posts I’ll share some tips and tricks about how to more effectively use the blog that you have just created here so stay tuned. We all have stuff we need to get done, yet why do most people never seem to free themselves from the cycle of always being busy? The simple reason is they are not focused. The world is divided up into stuff we like doing and stuff we don’t. The problem is that much of the stuff that actually needs to be done we don’t enjoy so we don’t do it. We find excuses to put it on the back burner while we go off and do something more enjoyable but far less important. Thus, the stuff that should be getting done continues to pile up and eventually the chickens come home to roost and we have no choice but to actually do it. However, rather than now being able to select the when we do the task we simply have to throw our next available free time at the task due to its urgency. We thus, no longer, have the choice of how we allot our precious time, it simply HAS to be allocated to get the task done. This is what people mean when they say they are busy. They are saying that they have to throw their available time allocations immediately at tasks they typically have not focused on or completed that can no longer be avoided. In short, they are no longer masters of their own time. If you ask people what their most precious resource is, few will nominate time. That is why they use it so frivolously. They don’t value it and that is a fatal mistake. Why? Because time is something you never get back once it is consumed. No one can get more time and we all have a limited amount of time but worst of all, no one has any idea how much time they do have on this earth. So why the hell do people throw it away so casually? They do so because they are unfocused. Because they haven’t created a plan to achieve their goals. Because they don’t value their time. If you begin to value your time as the most precious finite resource you have I’m pretty sure you’ll become laser focused on what you need to achieve. Try it and see. 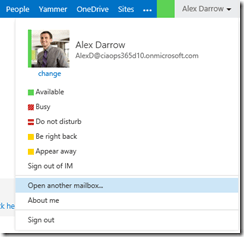 In a recent post I covered off how to create an additional location for files in OneDrive for Business to overcome some of the current syncing limitations. 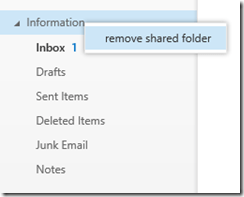 There is another way that you can store additional files (and other items) in your OneDrive for Business. 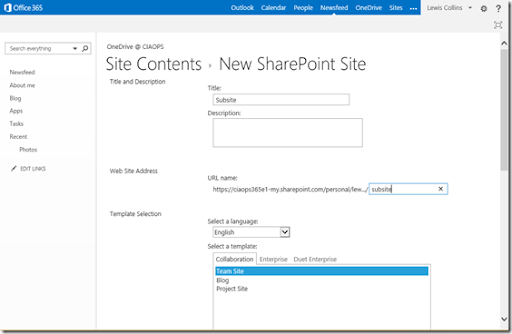 Because OneDrive for Business is effectively a SharePoint Site Collection you can create any number of ‘subsites’ under the primary OneDrive for Business site. 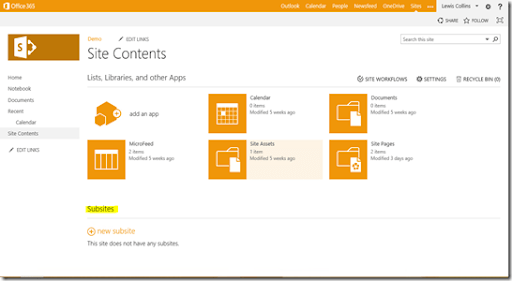 The default primary OneDrive for Business site basically only allows you to add document libraries as I showed in the previous post. 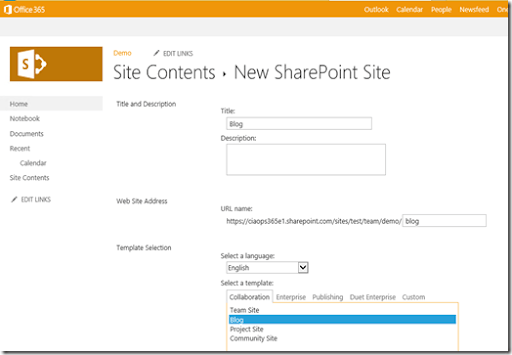 However, by creating a ‘standard’ SharePoint subsite under the default you get all the flexibility that a normal SharePoint site has. 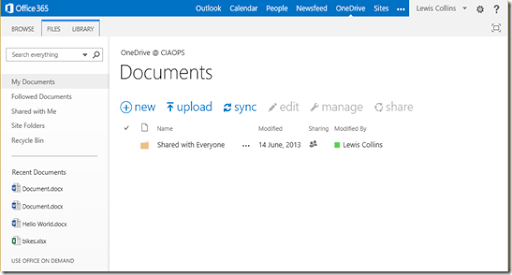 Firstly, navigate to your OneDrive for Business site. 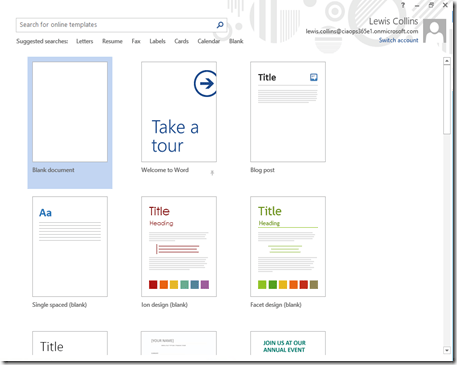 In the top right select the COG and then Site contents from the menu that is displayed. 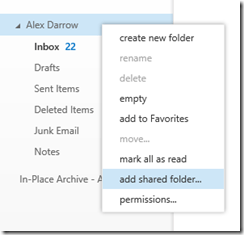 You should now see all the standard apps in your OneDrive for Business site. As the previous post highlighted, you can add an app here if you want. If you however scroll down to the bottom of this page you will find a heading Subsites and a link new subsite. Select this. 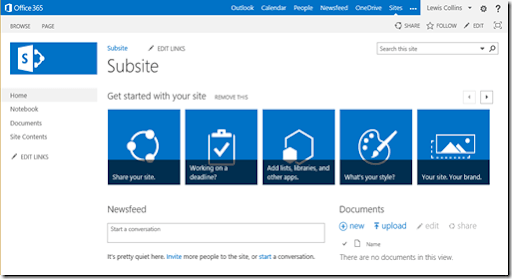 You’ll now be taken to the familiar SharePoint dialog that allows you to create a subsite. You give the new subsite a name and URL suffix. You then select which template you wish the subsite to be based on. Normally you select Team Site so all the features will be available to you. You generally leave the other settings as default and press the Create button. After a few moments you should see your subsite displayed. 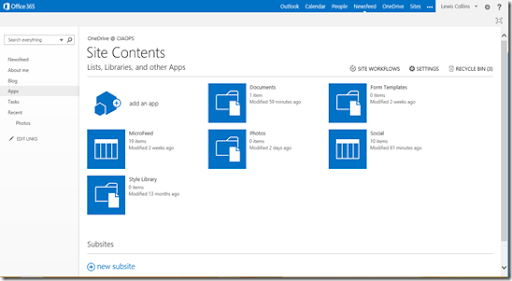 You can now go into the Site Contents for this new subsite and add something like a Picture Library which you couldn’t do in the primary OneDrive for Business site. 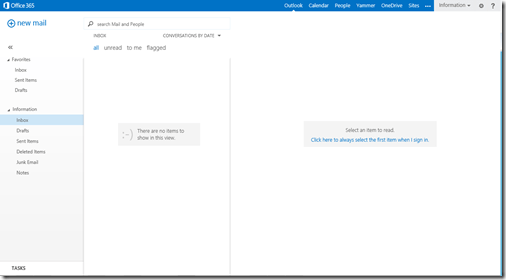 Unfortunately, the only way that you can sync items in a OneDrive for Business subsite is to select sync manually as mentioned in the previous post. They will also not automatically appear in any mobile clients. 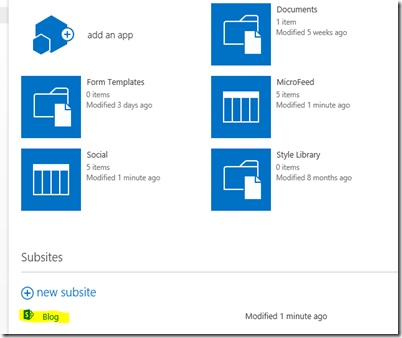 Thus, another way to divide up the space you have available in your OneDrive for Business apart from adding apps at the top level, is to create subsites off the primary site (just like any Team Site) and place you information there. Unfortunately, if you need to sync these items to your desktop you’ll have to do that manually and they also won’t appear in mobile clients. I was recently involved in a marketing presentation for SMB businesses. Some great tools where covered that would really help to automate marketing for any business. But, you know what? They are totally useless without two simple precursors. I remember a public speaker who once offered the whole audience the opportunity to contact him for assistance with the topic he was discussing (and it happened to be marketing). When questioned about why he made such an offer, his reply was that in his experience less than one percent of people actually took up his offer. Thus he felt very safe in making it. Even when people are all fired up after they walk out the door they rarely do anything. However, let’s say that you are fired up enough after leaving the marketing discussion to actually do something, the next hurdle you face is that you need to something consistently. Again, I would contend that less than one percent of that one percent actually take action and do so consistently. Now the positive here is that if you, one, do something and two, do it consistently you are going to be more successful than 10,000 of your peers (i.e one percent of one percent). These two little things are the reasons why so many businesses never reach their potential. Most take no action, even after paying money to learn about what to do as well as how to do it. The few that do simply don’t keeping doing it but in the meantime spend a fortune on all these tools that they think they ‘will’ use. They generally give up far to quickly because they don’t see results immediately. So by all means go out and see what tools and techniques are available but reconcile yourself to the fact that unless you take action and do so consistently such tools are simply wasted. However, if you do take consistent action you are going to be so far ahead of just about every business. You will be the one percent of the one percent and your chances of success will skyrocket. Success is more about consistency than anything else.